HARTMANN TRESORE offers burglar-proof and fireproof safes in various fire protection classes combined with different anti-burglary protection classes to suit your own, specific needs and requirements. 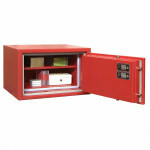 Check out our most popular burglar-proof and fireproof safes in this brief overview. You can also click on the button below to go directly to all of our bullet-proof and fireproof safes. 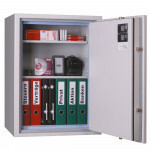 Burglar-proof and fireproof safes are equipped with both tested and certified anti-burglary and fire protection. As a result, a burglar-proof and fireproof safe ensures that your important documents and valuables are protected against not only burglary and unauthorised access, but also fire. 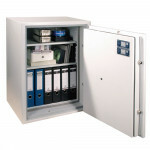 HARTMANN TRESORE offers these doubly secure safes of all shapes and sizes in a whole host of different anti-burglary and fire protection classes. Are you intending to use a burglar-proof and fireproof safe primarily for storing electronic data carriers such as CDs, external hard drives and SD cards? Then you’re in the right place, as we have a whole host of data media safes designed specifically for storing electronic data carriers. If you’re interested in creating a secure storage facility for larger volumes of documents within a room, a strongroom door offers the perfect protection. These bullet-proof doors can be styled in various ways to ensure the strongroom door complements the rest of the space perfectly. Before purchasing a burglar-proof and fireproof safe, you should take the time to find out about the various different types of anti-burglary and fire protection classes. It all depends on the valuables that you would like to secure – whether at home or at work – so you should also speak to your insurance company if appropriate. Take a look at our tips and information on purchasing a safe for an overview of what you should bear in mind when making a decision. When it comes to anti-burglary protection for safes, there are a number of different standards in place. The safes that offer the highest protection have been tested and certified according to the internationally recognised European standard EN 1143-1. These are officially known as strongboxes. A burglary test is carried out and the results of this are used to differentiate between the different resistance grades. Further standards include EN 14450 and VDMA 24992. When it comes to the level of fire protection afforded by a safe, the most important consideration is the length of time for which the documents stored inside will remain protected against fire damage – for example, 60 or 120 minutes. The most important standard in terms of fire protection is EN 1047-1, with another being EN 15659, although its fire-protection requirements are somewhat less stringent. Burglar-proof safes with security level B according to VDMA 24992 (05/95) and 60 minutes of fire protection for paper according to EN 1047-1. 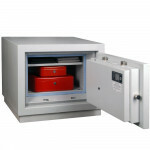 Burglar-proof safes with security level B according to VDMA 24992 (05/95) and 120 minutes of fire protection for paper according to EN 1047-1. 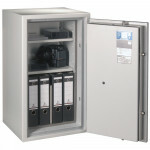 Burglar-proof safes with security level S2 according to EN 14450 and 60 minutes of fire protection for paper according to EN 1047-1. Burglar-proof safes with resistance grade N (0) according to EN 1143-1 and 60 minutes of fire protection for paper according to EN 1047-1. Burglar-proof safes with resistance grade I according to EN 1143-1 and 60 minutes of fire protection for paper according to EN 1047-1. Burglar-proof safes with resistance grade I according to EN 1143-1 and 120 minutes of fire protection for paper according to EN 1047-1. Burglar-proof safes with resistance grade II according to EN 1143-1 and 60 minutes of fire protection for paper according to EN 1047-1. Burglar-proof safes with resistance grade II according to EN 1143-1 and 120 minutes of fire protection for paper according to EN 1047-1. Burglar-proof safes with resistance grade III according to EN 1143-1 and 60 minutes of fire protection for paper according to EN 1047-1.